The sentiment is heating up in the high-end TV market as more rumors about Korean suppliers’ next-generation TVs came out. By the end of 2018, Samsung Electronics will release new-generation Micro LED TVs and the price could be as high as USD 300,000. Also, LG Electronics will start the global distribution of its new OLED TVs featuring its own AI platform DeepThinQ. Don-Tae Lee, Head of the Corporate Design Center, Samsung Electronics, revealed during an interview that a modular design was employed in the production of the Micro LED TVs. More flexibility will be added to product customization. 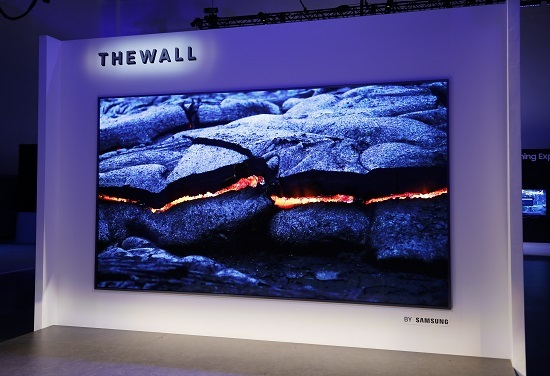 Although further details have yet to be settled, Lee disclosed that new Micro LED TVs could be larger than Samsung’s current largest lineup (88-inch). The company intends to target the new TVs at the high-end markets in the United States and the Middle East and market them as a substitute for computer projectors. On the other hand, LG Electronics just started yesterday the distribution of its new OLED TVs in the U.S. The distribution in other regions such as Europe, South America, and Asia will begin soon. Industry sources leaked two months ago that LG also plans to launch its first Micro LED TV this year. However, the progress still remains unknown at this point. Currently, LG also offers OLED panels to 13 TV manufacturers including Sony. The company expects to ship up to 2.5 million units of OLED TVs this year, much higher than the shipment (1.6 million units) in the previous year. Its annual OLED TV shipment is estimated to increase from 15% to 20% in 2018.